NASHVILLE, Tenn. (April 22, 2011) -- Some 23 Black Hawk helicopters have been freed from duty in the United States to go to combat elsewhere, thanks to stateside delivery of UH-72A Lakota helicopters. As Lakotas are fielded, said Col. John Thurgood, project manager for Army utility helicopters, they take Black Hawks out of the mix and send them back to combat. Gregory Gore and Col. John Thurgood spoke April 20, 2011, at a press conference regarding the Lakota program during the 2011 Army Aviation Association of America's Annual Professional Forum and Exposition in Nashville, Tenn.
"As we field the UH-72A, we are able to take Black Hawks at some of those units and give them back to combat units, and those combat units take those aircraft to the fight," Thurgood said. "So the Lakota is a very important part of our Army strategy to make sure our combat units have what they need." "And to make sure our states, our governors, our homeland-security missions have what they need -- this platform delivers all those things," he continued. Thanks to delivery of Lakotas, about one assault battalion of Black Hawks have been freed to return to combat, Thurgood said, about half of a combat aviation brigade. 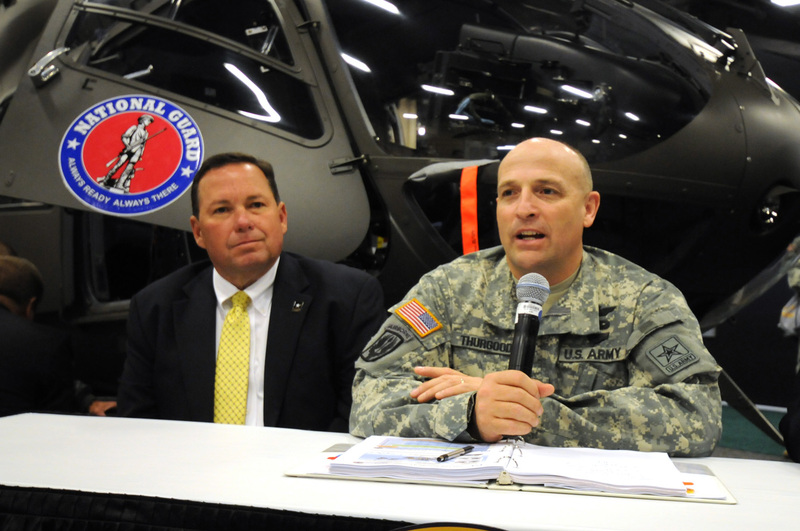 Thurgood, along with John Burke, program manager for EADS North America's light utility helicopter program, spoke April 20, 2011, at a press conference regarding the Lakota program during the 2011 Army Aviation Association of America's Annual Professional Forum and Exposition in Nashville, Tenn.
Thurgood said the Army has been pleased with both the aircraft and with contract performance. "They have been doing a tremendous job of producing every aircraft on time, or early," he said. "That's very important to us." Thurgood said the Army plans to purchase about 345 Lakotas, and today, about 154 have been delivered. "We are about halfway through the delivery of this program and doing it exactly on the cost and schedule that the Army asked it to do." The Lakota is a slightly modified version of the manufacturer's commercial EC145 aircraft. "We literally chose the EC145, painted it green, and we've only added to it -- the basic aircraft -- one thing, and that's an ARC-231 radio," Thurgood said. The Army "knew what they wanted and they have held to that requirement," Thurgood said regarding the Lakota. "Holding ourselves to that requirement without changing it really gives the program managers a lot of flexibility to use best business practices." Variants of the Lakota include a two-litter medical version, a VIP version used in the National Capital Region, a security and support version used for state missions by National Guard units, and a version used by "opposing forces" during at combat training centers. The S&S version of the aircraft, on display at the AAAA convention, sported a mission equipment package with a search light, a GPS navigation system that allows pilots to find locations by street address as well as military grid coordinates, and a visual sensor ball that can transmit imagery to a ground station. Thurgood said there will be small continuous modifications for the Lakota -- the sensor ball might become obsolete, for instance, and may be changed eventually. But because the Lakota is essentially a commercial product, the manufacturer is incentivized to do continuous improvements on their version of it -- improvements the Army can opt to buy into without having to fund. "If they decide to put on a new tilt rotor system then the Army gets to take advantage of that without the investment to do that," he said. Conversely, for an aircraft like the Black Hawk -- the Army must pay for such modifications, Thurgood said. Right now, the Lakota is fielded to National Guard units for state support, disaster relief and homeland defense, and in the active component where it's used in non-deployable units for medical evacuation and at training centers, for instance. "There is no better aircraft in the military's inventory right now for domestic operations -- there is none," said Chief Warrant Officer 3 Kevin Mudd, Utility Helicopters Project Office, Redstone Arsenal, Ala. "With its communications, sensors, and ability to be in a location you're not used to and still function and complete your mission -- this is the premiere domestic-operation platform right now."